Over the past few months you may have seen my many tweets or instagrams about the Kendal Bootcamp Class that I have been attending. Some of you know exactly what bootcamp is and attend one locally, others are intrigued and want to know exactly what they would be letting themselves in for. 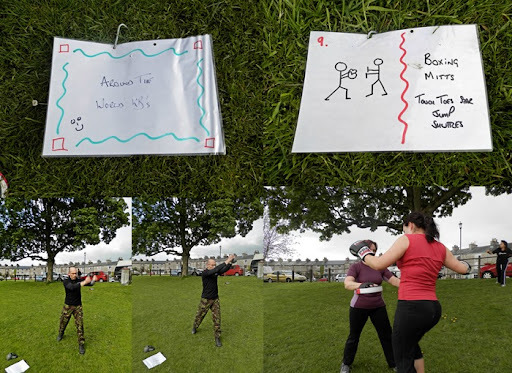 So this post is a review of the class and an explanation of exactly what you can expect at a bootcamp class. What is a bootcamp class like? 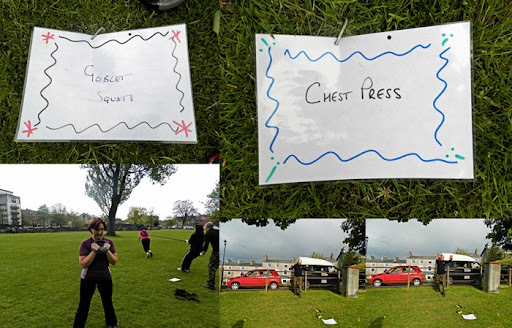 Obviously all classes will differ, however they are all based around the same principles of getting out in your local park, getting you to work hard by mixing strength and cardio, getting muddy, having a laugh, and getting results! 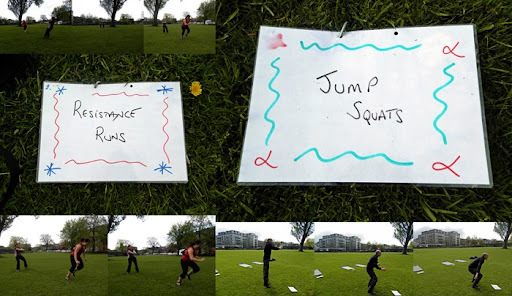 So to start with there is about a 7 minute warm up which in my class consists of jogging about 100 meters about 4 times; alternating between high knees, side shuffles, heels to bums etc. During the 7 mins we also do a few 10 second bursts of sprinting on the spot, some punching and ab twists. The 7 mins really does warm you up from head to toe and can be quite tiring; in my first class I was knackered after only the warm up! After everyone is warm we go into a cardio circuit. The cardio circuit is done in pairs and consists of 4 different stations. Person 1 completes an exercise at the station while person 2 sprints out to a lamppost about 70 metres away and sprints back. The whole time that person 2 is running person 1 will be completing an exercise such as mountain climbers, jumping jacks, holding a plank, push-ups or whacking a large tire with a 10 pound hammer. Once person 2 returns you swap. So this time, person 1 will be running to the lamppost and back while person 2 completes the exercise. Once the pair have both completed the exercise they move onto the next station which will consist of exactly the same thing, one runs while the other competes an exercise Obviously the exercise is different at each station. Sometimes when our trainer, Ady is feeling mean he makes one of the stations a Bergan run, so instead of just sprinting off while your partner does the exercise, you have to sprint off while carrying a 30 pound rucksack on your back! It is very much pair work as the slower your partner runs the longer you have to complete the exercise. There is no rest between the exercises and you move quickly from one movement to another, meaning your heat rate is high and you are burning fat fast! It’s a tough ten minutes, but much more effective than traditional workouts. Once everyone has completed the 4 stations we move onto the next circuit which has 7 stations that vary between cardio and strength. Each one works a different area of your body. The photos above give you a good indication of what the stations can consist of. This circuit is timed and each station lasts for 1 minute, which doesn’t sound long but when you are doing squats/running with a tire/holding a plank it is a loooong time! Ady walks around each of the stations during the minute to ensure that you are doing the moves correctly, getting the most out of it and pushing you to work harder. Thankfully he’s not a nasty drill sergeant that shouts in your face, he just offers gentle encouragement to push you harder, run faster and squat deeper. He knows each of the bootcampers well and understands their motives and fitness levels and adapts his approach to each of them. After everyone has completed each of the stations we all play a game/relay race. This is a great fun way to finish the session, and gets everyone’s competitive side out, but it also provides a good laugh. After the games we cool down and have a good chat. You can probably gather from my write up that I am an avid bootcamper. I go three times a week and actually find myself looking forward to class. It has to be the only form of exercise that I want to do all the time i.e no matter what my mood I still want to go to bootcamp. It works me hard, I always have a good laugh, I’ve made some great friends, it’s affordable and I’m seeing amazing results. I have been going to bootcamp for about 6 weeks now and I have seen a huge difference in my fitness levels and stamina. To be honest with you I thought I was fit until I went to the first class and almost threw up after only 25 minutes! I still get my but kicked every session but the joy with bootcamp is you get out of it what you put in. Everyone can benefit from it, you just have to go at your own speed… which for me is faster that it was 6 weeks ago. I don’t weigh myself so can’t tell you if I’ve lost any pounds, but I have significantly toned up and now have lovely toned arms, with a pretty good muscles definition; my bum is more lifted and rounder, rather than just being large; my legs are getting more toned and my cellulite has almost disappeared; and for the first time in years my abs have some definition. Overall I could not recommend a bootcamp class more. If like me you are anxious about starting a new class, please just bite the bullet. I put off coming for a long while because I was too anxious about meeting new people and starting something new, but I am so glad I had the courage to attend. I have significantly improved my fitness levels, which has helped massively with my running, and have toned up so much in only 6 weeks; I can’t wait to see what I look like in another 6 weeks! 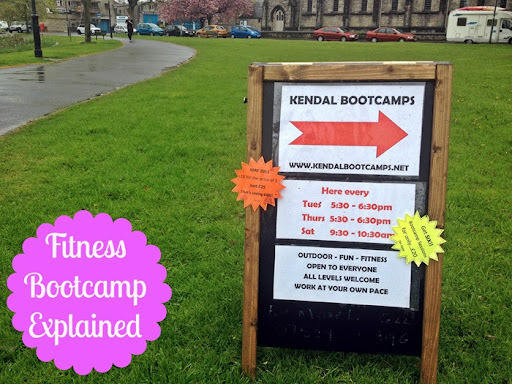 If you do live in Kendal and the surrounding area then please visit Kendalbootcamp.net for more info. Come down and give it a try or drop Ady an email or text; very often he lets you try your first class to see what its like and if it’s for you. For June there is 50% off so you can attend all classes in June for only £25… bargain! Do you attend a local bootcamp class? Do you love it as much as I do? Do you regularly attend a different type of exercise class that you love as much as I love bootcamp? I am a total bootcamp junkie, I've been going to my local class for just over a year. It's by far the best thing out there for getting in shape and is the backbone of my fitness schedule. LOVE IT! It's now the backbone of my fitness schedule aswell. I love it so much! cool! would you like to follow each other in gfc and bloglovin? let me know!